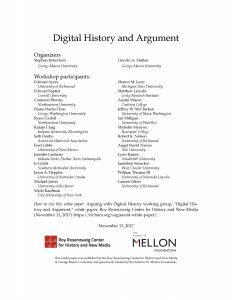 This white paper is the product of the Arguing with Digital History Workshop organized by Stephen Robertson and Lincoln Mullen of George Mason University, with funding from the Andrew W. Mellon Foundation. The two-day workshop, which involved twenty-four invited participants at different stages in their careers, working in a variety of fields with a range of digital methods, was conceived with a focus on one particular form of digital history, arguments directed at scholarly audiences and disciplinary conversations. Despite recurrent calls for digital history in this form from digital and analog historians, few examples exist. The original aim of the workshop was to promote digital history that directly engaged with historiographical arguments by producing a white paper that addressed the conceptual and structural issues involved in such scholarship. Input from the participants expanded the scope of the white paper to also elaborate the arguments made by other forms of digital history and address the obstacles to professional recognition of those interpretations. The result was a document that aims to help bridge the argumentative practices of digital history and the broader historical profession. On the one hand, it aims to demonstrate to the wider historical discipline how digital history is already making arguments in different forms than analog scholarship. On the other hand, it aims to help digital historians weave the scholarship they produce into historiographical conversations in the discipline. To produce the white paper, the organizers, Robertson and Mullen, shaped documents created by small groups in the course of the workshop, together with the response papers submitted by participants prior to the workshop, into a draft document. That draft was made available as a Google doc to the participants, and those who had been invited but had to withdraw, for comments. Robertson and Mullen then revised the draft in response to that feedback to produce the final white paper. All those who participated in the workshop or provided feedback on the draft are credited as authors of the white paper. A roundtable on the white paper, featuring participants in the workshop, will be held as part of the annual meeting of the American Historical Association, from 1.30 pm to 3.00 PM on January 6, 2018. This content was selected for Digital Humanities Now by Editor-in-Chief LaQuanda Walters Cooper and Greta Swain based on nominations by Editors-at-Large: Greta Swain, Haider Ali, Jessica Dauterive, Jose Sala, Kelsey George, LaQuanda Walters Cooper.